I lost my mom in 2015. It came only a few months after losing both my grandfather and my generally optimistic mindset. I came face to face with the realities of old age while caring for my 91-year-old grandmother, who passed away 10 months later. 3 of the most significant people in my life within 22 months. In the months after my mom died, it felt like my family was falling apart. I had such a shocking mental and physical reaction to this emotional weight that I became quite a stranger to myself. It was so unfamiliar in its intensity and longevity that I didn’t realise it was clinical depression. Once I started seeing a therapist, images started populating my mind and a compulsion to return to art surfaced. Neurological pathways that were overgrown and covered in spider webs were dusted off and given some streetlights. But here lay a very scary place for me, because I had convinced myself that I was not a ‘real’ artist. Artists had to work in a particular way and express themselves with tools in a particular way. Tools that I had not been using since my university art lecturer told me that I should follow the Graphic Design and Illustration track instead of fine art, because I would not be able to make a living as an artist. I didn’t have a natural gift for painting, sculpture and lithography, but I was perfect for the precision of visual communications. The separation in my mind between the two was so absolute that I dared not cross it, no matter how frustrated it made me. A simple sentence from the psychologist unblocked it all: I had to accept who I was. To get over the hump, I had to accept that my tools are digital: a computer, a digital pencil and an iPad screen instead of a canvas. These are fantastic tools when one needs to bust out an annual report in 2 days, but quite unsatisfying when one needs tactile experience. In my mind it was also not how ‘real’ artists work. Printmaking, of all the arts, lies the closest to my training and has opened the door to the next room, where unexpected blotches and streaks of ink can dirty up the careful and neat place I have been occupying with creative work. There is no ‘control-z’ button! There is, however, great joy to be found in the discipline of printmaking, especially when combined with the regimented craft of stitching and the precision needed to ensure that all the prints in a series are as identical as possible. I was raised with crafty things – sewing, knitting, pottery, batik, potato printing, lino printing. My brother and I made paper mâché circus performers and several trompe l’oeil paintings on the outside of our house. The death of my mom brought back a yearning for the freedom and safety in those crafty things. I had dreams of 70s and 80s crafts – like string art. It interrupted my usual orbit around perfect computer images. The need for imperfect things became clear. Trying to allow both perfect and imperfect things in my mind has been the most rewarding adventure. Once I started making prints I had to make peace with the next demon: even in my depression, pain and rage, my pictures turned out ‘pretty’ and whimsical. Possibly a typical symptom for people who struggle to express negative feelings. But this is who I am. 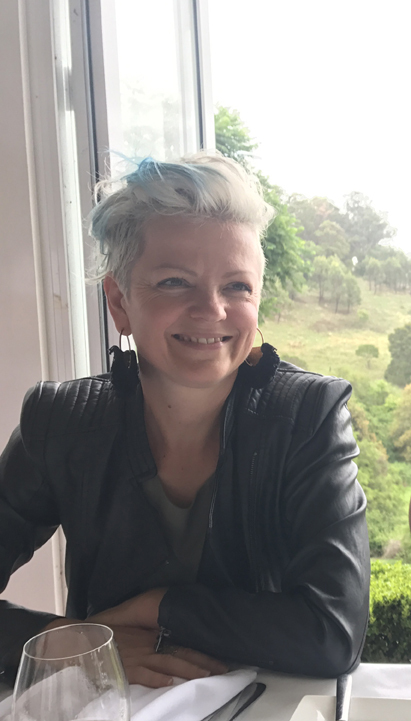 Lana de Jager immigrated from South Africa to Australia in 1998 and settled in Melbourne, Victoria, mostly because of the excellent coffee. 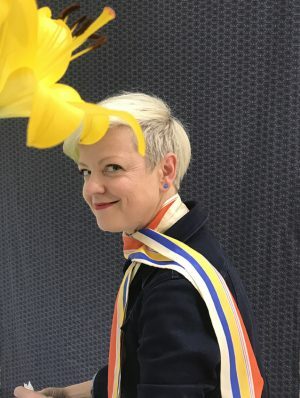 She is passionately committed to whimsy and entirely too enthusiastic about Art Nouveau, pre-1960’s music that might lead to dancing, attempting to knit, and pretending to understand science. She also works as a freelance Graphic Designer. Lana obtained a BA Honours Degree in advertising & visual communication in 1994. The first year was a fine arts curriculum and she enjoyed it tremendously, taking part in several group exhibitions. A figure of authority suggested that she make the responsible decision and follow the graphic arts stream (sketching and airbrushing for graphic design rather than for fine art) from the second year onward to ensure that she would be able to buy her own groceries in the future. 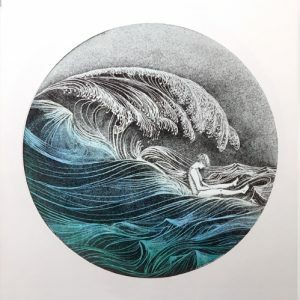 With her artistic aspirations successfully dashed, Lana followed her degree with 2 years as a lecturer [1995 – 1996] at Potchefstroom University and the East London Technical College [South Africa], teaching Graphic Design History & Techniques, History of Art and Still Life & Figure Drawing. She was also responsible for organising and advertising student exhibitions. Several continents, half a lifetime and much cognitive behaviour therapy (twitch) later and the imbalances of yesteryear have been addressed. 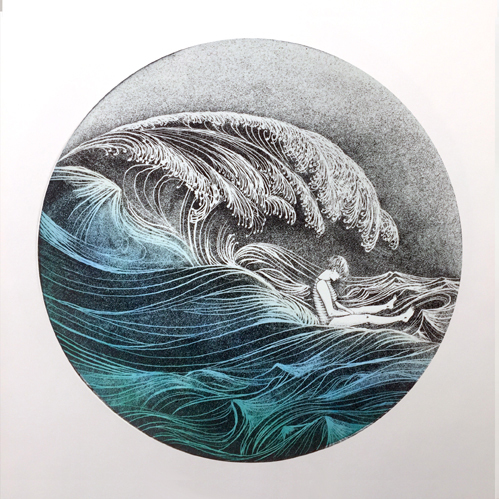 In 2013 she returned to intaglio printmaking, but it was only in June 2016 that she became fully committed to dreaming of being a real artist. Lana uses polymer plates for intaglio printing (photogravure), with a preference for less-toxic materials and processes. 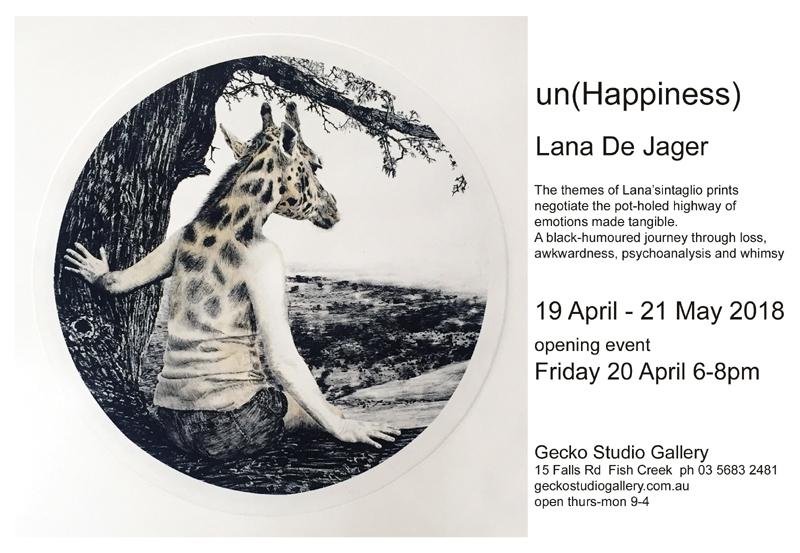 Lana’s images deal with motives of loss, grief and unhappiness as experienced by optimists and people who struggle to express their feelings. These are themes that will continue to be carefully mined for quite some time to come. 2. EDITIONS (February 2017) – Tacit Contemporary Art Gallery in Abbotsford, VIC. Group Exhibition. 4. SMALL WORKS ART PRIZE (December 2017) – Brunswick Street Gallery in Fitzroy, VIC. Group Exhibition. 5. 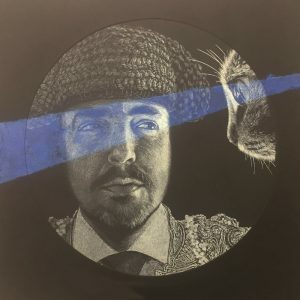 EDITIONS (7-18 February 2018) – Tacit Contemporary Art Gallery in Collingwood, VIC. Group Exhibition. 6. THROUGH A GLASS, DARKLY… (9 Feb – 15 March 2018) – Gallery@ CollinsPlace, Melbourne, VIC. Group exhibition curated by Marguerite Brown. 7. TRAVERSE (May 2018) – Gallery@ CollinsPlace, Melbourne, VIC. UPCOMING Solo Exhibition. 8. INNER CIVILISATIONS (18 July – 12 August 2018) – Tacit Contemporary Art Gallery in Collingwood, VIC. UPCOMING Solo Exhibition. 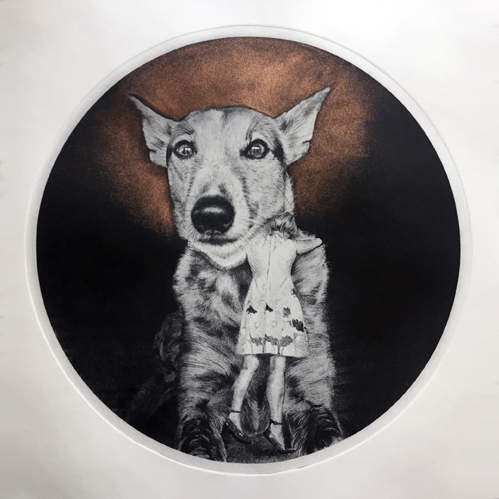 Thanatophobia – Photogravure – Charbonnel ink and copper pigment on Stonehenge paper – I love a beautiful dog, named Disco. He is still alive but sometimes I am overwhelmed by a sadness for when he won’t be anymore. The irrational fear of the loss of things we love comes up when a huge loss occurs. It debilitates rational thought and breaks the mind while it hangs around. Stay very still and maybe it will go away – Photogravure (A la poupée) – Charbonnel ink on Hahnemühle Paper – Simple and enormous overwhelm – we all know how that feels. Sometimes we are resilient enough to face it and sometimes we not. The overwhelm of grief & loss can come in waves of such spectacular proportions that it feels like it locks us in place, with no other option but to surrender to what petrifies us. 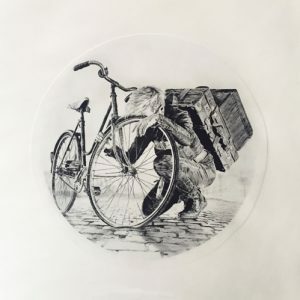 Time to break up with that baggage – Photogravure – Charbonnel ink on Stonehenge Paper – Part of the vocabulary of our family is the concept of a person having ‘a flat tyre’. It’s more than just a lack of energy – it can be used to explain a tired & emotional child crying at the end of a big day or of an adult sitting/sagging in an armchair after too much booze. In this case it’s very much to do with feeling hopeless. 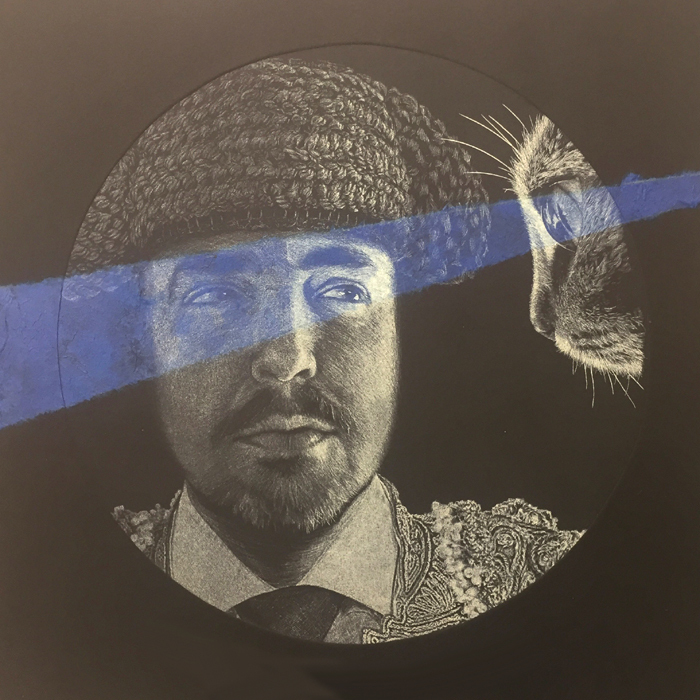 Laying down the gauntlet – Photogravure & Chine-collé (Khadi Tissue) – Charbonnel ink on Stonehenge paper – For his 40th birthday present, my brother gave himself the gift of dropping out of corporate world and pursuing his immense talent at an art academy in Barcelona. He was know as Carl Cat in our family, thanks to a school play and a gorgeous cat outfit my mom made. Here he is as a toreador, daring his younger self to take on something that seemed impossible in previous years – taking the creative bull by the horns!